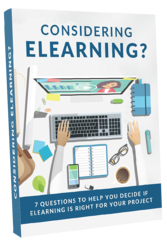 How do you know if eLearning is the right tool for you? While measuring the hard-cost savings from eLearning can be easy (less travel, fewer trainers, etc. ), tracking some of the soft-cost savings can be much more difficult. eLearning is a powerful way to learn, but not all skills work best with eLearning. Discover what subject matter is best suited for eLearning. It takes more than good course material to make eLearning a success at your company. Find out what else needs to be in place.